One of the biggest mistakes in love is expecting your partner to know you so well that he or she will instinctively recognize exactly what you want and need. Is your partner psychic? Does your partner have ESP? No! You shouldn’t presume that he or she has such abilities. No matter how intuitive he or she is or how connected the two of you may be, others can ever know exactly what you are thinking—unless you tell them. That has nothing to do with how much they love you. More importantly, if you love them, you shouldn’t want to put that kind of pressure on them. You need to know how to communicate better to keep your love you alive. If you don’t express your desires and your partner doesn’t get them precisely right, you only have yourself to blame. If you have an expectation, especially if it’s important to you, the only way to avoid disappointment and hurt feelings is to share your wishes with your partner. Now, having said that, that doesn’t mean you can control what your partner does; all you can do is make the request. It’s still up to him or her to decide whether or not to fulfill your request. Sharing your feelings, good or bad, is absolutely crucial to the happiness of your relationship. If your partner doesn’t know what’s bothering you (or what makes you happy), how can he or she do anything about it? Vice versa, you have to know what’s bothering your partner so your imagination doesn’t make things worse. I realize it’s really hard for some people to talk about their feelings. But if you can create a loving atmosphere, it will get much easier. You have to establish trust. 1) Extend an invitation. If you have been snapping at your partner and making sarcastic remarks (emotional ambushing), it’s going to be hard for him or her to trust you at first. Buddhists very wisely believe that if you genuinely feel compassion toward another person, there’s no way you can be angry with him or her. Try to look at things from your partner’s perspective before you take any action. 2) Actively listen. Take turns speaking, pay full attention and allow your partner to finish their whole thought before you respond. Never interrupt or assume you know what your partner is going to say; in fact, assume you don’t. Most importantly, don’t plan your rebuttals while your partner is talking. You need to hear what your partner has to say. 3) Confirm you understand. When your partner finishes his point, do not respond until you confirm you understand what he meant—especially if you took something personally or it upset you. All too often people get defensive about something that they perceived incorrectly—usually because their own thoughts distracted them from actively listening. Put what you heard into your own words and include what you interpreted from your partner’s body language. 4) Respond compassionately. The goal of any conversation should be to improve your relationship. Use “I” statements. “I” statements indicate that you take responsibility for your thoughts and emotions. Don’t blame. “You” statements blame. When you blame, people naturally get defensive, and you’ll probably end up arguing. It’s not about making others wrong; it’s about telling them what you need from them. 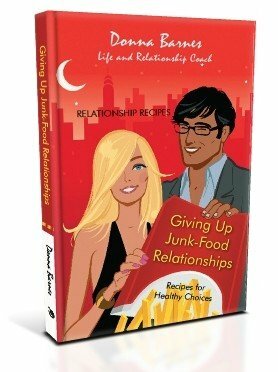 You can learn more about how to communicate better in my book: Giving Up Junk-Food Relationships: Recipes for Healthy Choices.